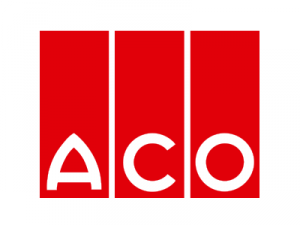 ACO stands for top quality building and surface drainage worldwide. As a globally active business, the ACO Group is represented in over 40 countries. ACO DRAIN® systems for line and point drainage, and ACO SELF® drainage systems and construction elements for house and garden are in a class of their own and household terms well beyond Europe. Manufacturing competence in polymer concrete, reinforced concrete, stainless steel, cast iron and plastic, not to mention system solutions for construction, gardening & landscaping, and sports arenas, are all part of the broad spectrum of products available from the world market leader in surface drainage. Drainage channels and yard drains, facade channels, ground reinforcement meshes, door-mat well systems, downpipes. Thermally-insulated basement windows, utility room windows, light shafts, floor drains, backflow stops, manhole covers, pipe ducts. Flat roof, balcony and terrace drains, floor drains and channels, bath systems, pipe systems, backflow stops, manhole covers. Grease separators, starch separators, process engineering. Wastewater lifting units, submersible pumps, complete pump stations. Products for arenas, playgrounds, gardening & landscaping.